More than ten million children suffer from severe acute malnutrition globally each year. In Uganda, longstanding efforts to understand, treat, and then prevent the condition initially served to medicalize it, in the eyes of both biomedical personnel and Ugandans who brought their children to the hospital for treatment and care. Medicalization meant malnutrition came to be seen as a disease—as a medical emergency—not a preventable condition, further compromising nutritional health in Uganda. Rather than rely on a foreign-led model, physicians in Uganda responded to this failure by developing a novel public health program known as Mwanamugimu. The new approach prioritized local expertise and empowering Ugandan women, blending biomedical knowledge with African sensibilities and cultural competencies. 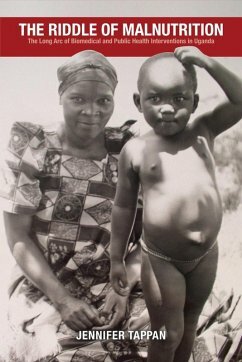 In The Riddle of Malnutrition, Jennifer Tappan examines how over the course of half a century Mwanamugimu tackled the most fatal form of childhood malnutrition—kwashiorkor—and promoted nutritional health in the midst of postcolonial violence, political upheaval, and neoliberal resource constraints. She draws on a diverse array of sources to illuminate the interplay between colonialism, the production of scientific knowledge, and the delivery of health services in contemporary Africa. Jennifer Tappan is an associate professor of African history at Portland State University. Her research focuses on the history of medicine and health in Africa, and her work has appeared in the International Journal of African Historical Studies and the edited volume Global Health in Africa: Historical Perspectives on Disease Control.